There were still a couple of peaks on my to-do list in the Rockies, but Vaux and the Goodsirs sounded like epic choss battles, so I decided instead to leave on a high note. I recently picked up David Jones’ Rogers Pass Alpine Guide, which details a number of low-5th-class routes in this most accessible part of the Selkirks. Other than the popular Uto and Sir Donald, there is not a lot of information online about the area. I chose this traverse somewhat at random, partly because it uses an approach with which I was not familiar. The rock was more broken than I expected, which was disappointing, but the boulders were mostly stable, and there were some sections of enjoyable climbing on the Swiss Peaks. The guide describes going Rogers to Hermit, but I thought it made more sense to go the other way, ending on the highest peak. Having now done it, I think my direction is best, at least psychologically. The Trans-Canada Highway is being widened to four lanes, and this summer work is taking place on Rogers Pass, making it congested and noisy. Fortunately the Illecillewaet trailhead is far enough from the highway to be somewhat quiet, so I got a decent night’s sleep there before heading back across the pass to the Hermit Meadows trailhead. 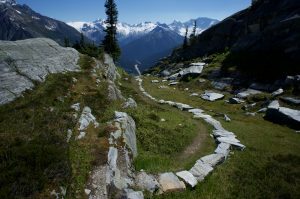 The well-maintained trail climbs steeply to the alpine, where it ends at some bear boxes and wooden tent platforms. There is also a sign saying “end of trail,” perhaps to help whiny kids convince their parents to turn around. The trail, of course, continues past the sign, crossing a couple of braided streams before fading and disappearing in glacier-scoured slabs. 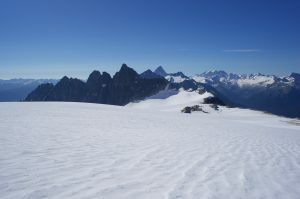 I made my way up the slabs, then put on crampons to cross the low-angle ice plain of the Swiss and Tupper Glaciers to the base of Hermit’s southeast ridge. Unfortunately it is not a solid fin like Sir Donald’s northwest ridge, but more of a giant talus maze with occasional steps. Still, it was fun enough, and mostly straightforward until the summit towers, where there was some route-finding required to pass gaps in the ridge. The descent was mostly straightforward class 2-3 left of the ridge, with a final bit of 4th class getting to the saddle with Truda. 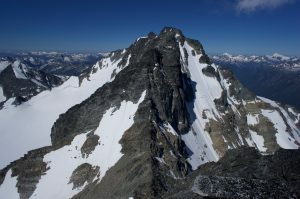 Truda, Swiss, and Fleming look distinct from below, but along the ridge, they feel more like small false summits on a single, broad massif. The best path generally stays on the ridge crest, though, so they are hard to miss by accident. Starting up from the col, I went left, then up a chimney/dihedral to regain the crest. Along the crest, I found a mixture of face climbing with positive rails, and big talus. There were some 5th class moves here and there, but nothing sustained. There was also a snow crest, which I crossed kicking steps and plunging my axe. As I neared Rogers, the glacier northeast of Rogers comes into view. 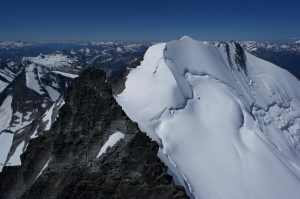 Unlike the Swiss and Hermit, which are flat and tame, it is steep and viciously crevassed, falling into some pathless valley. I stayed mostly on rock, then finally booted up the low-angle part of Rogers’ snow crest. I found the only register of the day, with a couple of familiar names, but no pencil to add my own. I could have continued down Rogers’ west ridge, but that looked long and chossy, so I instead retraced my steps to descend the broad couloir from the Rogers-Grant col. This proved more annoying than it looked, but still probably better than the ridge. There had been fresh snow in the last week, adding a bit more depth to the layer of slush over the underlying ice. The slope was not especially steep, but the snow was awkward and it ended in a bergschrund, so I ended up descending in crampons facing inward. The otherwise-tame glacier even gave me a nip, as I sunk a foot into a small crevasse I would have seen if I hadn’t been facing in and staring at my feet. 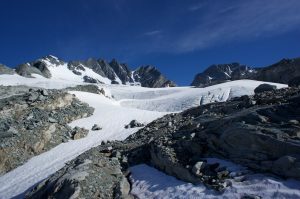 Once past the ‘schrund, things got much easier, and I took off my crampons to walk and slide back to where I had stepped onto the glacier in the morning. From there, it was mostly easy travel down the slabs to the trail. There was no one camped on the platforms as I passed, but I met several dayhikers, and a few people headed up to camp. A guy by himself looked like he might be up to do some scrambling, so I stopped to share some beta. As we talked, a solo girl walked by barefoot in booty shorts; I wasn’t sure where to direct the male gaze. Excitement done for the day, I hike-jogged the rest of the switchbacks to the sound of road construction, reaching the car mid-afternoon. I threw away my collected tat, washed up a bit, and headed to the visitor center to sit and write.